How many times have you opened up a magazine for garden ideas only to be discouraged by photos of unattainable gardens owned by the wealthy? Last week I had the honor of travelling with my friends in the Troy-bilt #Saturday6 to plant a community garden and visit the extraordinary formal gardens at Vizcaya, but rather than just give you a tour, I'd like to use the experience to share some tips you can use to make your own garden spectacular, even if you're short on time, money and space. Use your imagination, people! 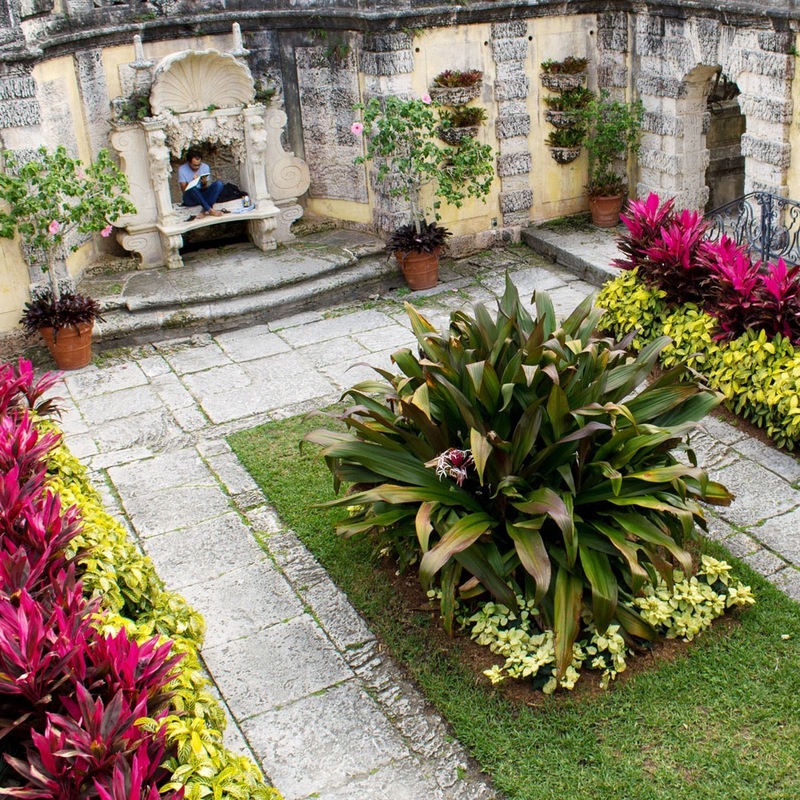 Before we begin, let me talk a little about the Vizcaya mansion, the gardens and the man who had it all built. 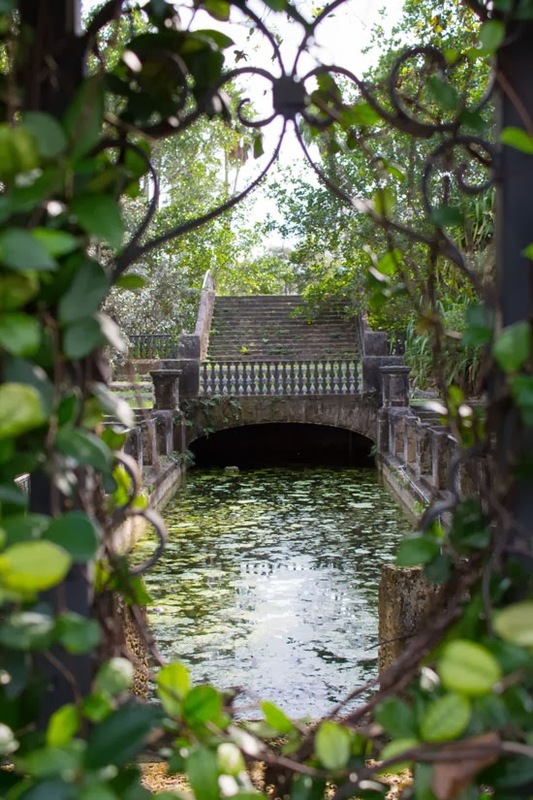 James Deering was the industrialist magnate who built this Italianate mansion and its sprawling gardens between 1914 and 1922, and the project was so massive that the far-flung fledgeling city of Miami got a tremendous boost to its economy. 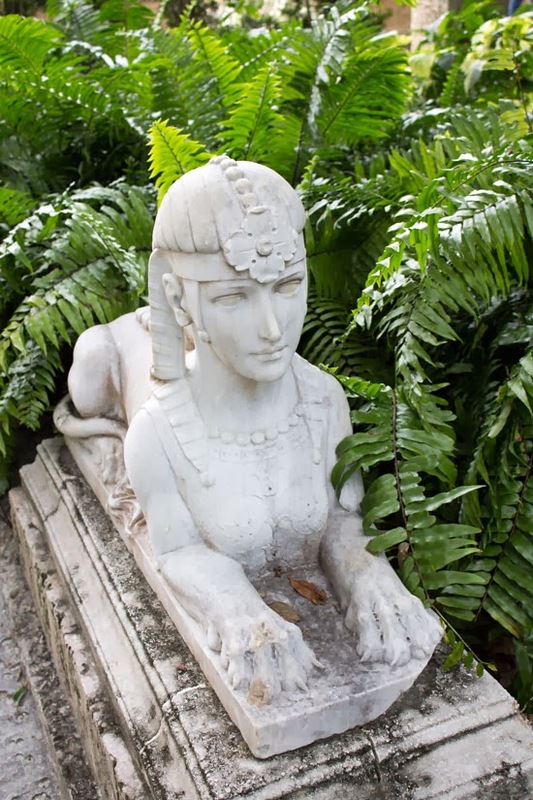 Priceless art and antiquities were shipped overseas from Europe, but the majority of the artistry was the result of local Floridian craftsmen, sculptors, artists and average Joes who worked tirelessly to create what Forbes calls one of the 10 most beautiful mansions in America. But what good is a grand mansion without even grander gardens? The landscape surrounding the mansion was every bit as important as the building itself. Sure, a lot of money and manpower went into Deering's estate, but you don't need any of that to adapt its grace and glamour to your own postage stamp of a backyard. 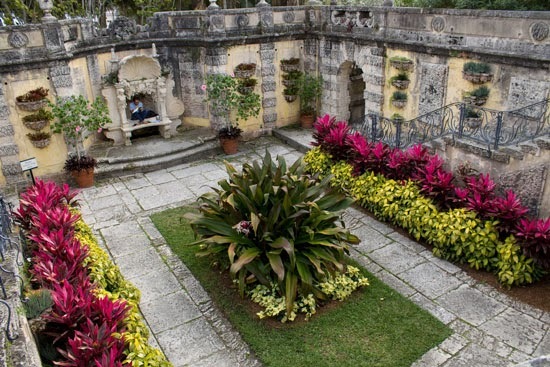 It is rather the ingenuity and creativity of Vizcaya's landscape architects and planners throughout the years that make this garden remarkable, and those are two qualities that most gardeners already possess. 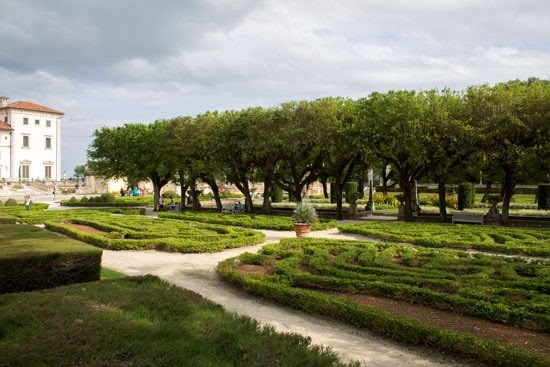 Here are some ways that the landscape architect Diego Suarez and later designers such as the present day chief horticulturalist, Ian Simpkins, have made these gardens great - along with ways to incorporate those ideas into your own garden. Each garden presents its own set of challenges - glaring afternoon light, unworkable soil or eyesores to cover up, to name a few - but it really helps if you happen to have a fortune and hundreds of workers willing to move heaven and earth for you if necessary. Diego Suarez in particular, was a landscape architect who practically did just that. 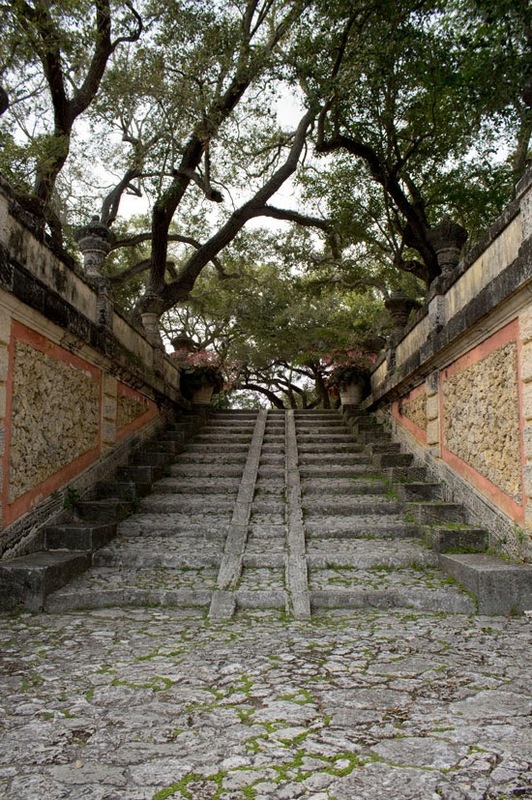 Deering demanded a sweeping view of Biscayne Bay to the east and the gardens to the west, but when the harsh and tropical afternoon light became too much to bear, he had his landscape architect Diego Suarez formed a large hill topped with an arcade (little house) directly to the west. The tall live oaks successfully filtered the blinding light and cast a golden glow over the gardens to this day. Apparently, even the sun can be bargained with if you have a great landscape architect. It's amazing what the right kind of filtered light can to to a garden. It probably isn't very realistic for most of us to build oak-planted hilltops in our backyards, but it is possible to alter the kind of sunlight your garden receives by planting or selectively pruning trees and shrubs. Choose trees that won't become too large for your site or produce too much shade if you want them to work out in the long run. You can also interplant smaller fast-growing trees/shrubs while you wait for the larger trees to fill in.To let more light in, 'limb them up' by selectively pruning out a few main branches; or remove unwanted trees entirely. Just consult with (or hire) a certified arborist first to be on the safe side. It isn't the coral studded stone gateway that makes this garden so irresistible, but rather the view beyond. 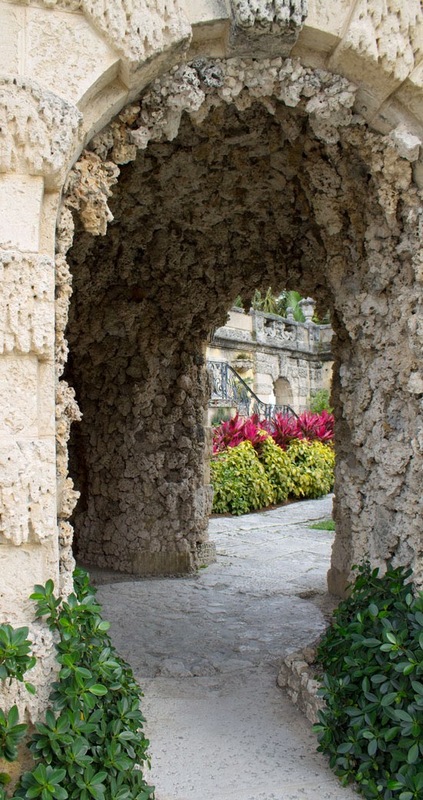 When Noelle Smith Johnson and I started wandering away from Deering's mansion, I caught a bright flash of pink and chartreuse from the corner of my eye through a limestone doorway with its walls and ceilings whimsically encrusted with coral. Sure, the opulent grandeur of the weathered vaulted ceiling was impressive, but it was that hidden burst of color peeking out from behind the doorway that made this courtyard garden worth investigating. Home gardeners can create a similar air of mystery by using anything from wooden gates to gaps between walls or hedges, and even a tall shrub inside the curve of a walkway can be used to conceal a gratifying view beyond. While the gateway itself can be a focal point, there isn't much point unless the scenery beyond warrants investigation. These carved seashells were made to show off orchids - now they hold succulents. But lets talk a little more about those awesome vertical gardens, shall we? We've all seen them become en vogue lately, but I was flabbergasted to see some built right into the walls of an early 20th century garden. Originally these little carved niches were made to showcase orchids, but since orchids need more protection from the sun, they now hold succulents. Succulents and bromeliads bloomed and trailed over the edges, providing an interesting distraction at every step up and down the stairs. The whole courtyard felt like a botanical treasure trove! Don't worry if you don't have an ornately carved wall to deck out in succulents; you can get the same look by using a variety of other hanging containers. Anything from Woolly Pockets and coir-lined baskets to moss-lined wire frames, bird cages and framed vertical gardens will do the trick, but I'm personally partial to my Rainforest drops. Here's how to make them. This marble sphinx was carved in France. Everyone needs one of these. If you really want to be a showoff in the garden, it's time to break out your collection of treasured European marble statues. No need to worry if you don't have a life-sized marble figure of Contadino lying around; I make do with a ceramic snail given to me by my friend Christina Salwitz as a housewarming gift. 'Salty' might not command the same prices at auction, but I'm pretty sure that he commands an army of snails when I'm not looking. Keep 'em away from my perennials, Salty. You can't go wrong with pink and chartreuse. The secret garden's monotonous green clipped hedges and topiary of yesteryear have now been replaced with loud and exuberant tropicals such as ti plants (Cordyline fruticosa 'Red Sister'), 'Queen Emma' Crinum and Sanchezia speciosa. 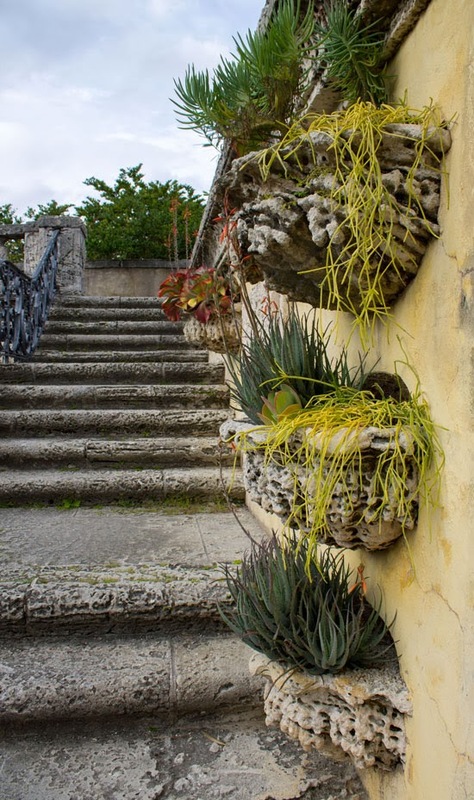 (Not that there's anything wrong with the original plantings... it's just that this special place really needs something exciting) Carved limestone sconces of a sort were planted with succulents and used to create a magical looking vertical garden. 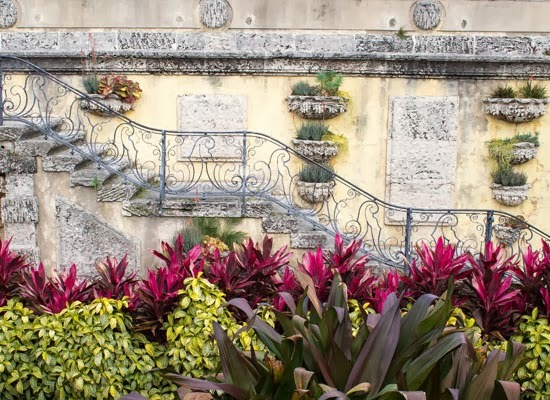 What makes the gaudy use of color work in this case, is the fact that the horticulturalists deliberately chose a handful of plants and stuck with them to create massed plantings along the sides of the garden and place a single architectural looking clump of the purple crinum front and center as the focal point. It just wouldn't be the same without those colors. Notice that it isn't the expensive building materials that make this garden work, but the plant palette and how they've been grouped. And while gardeners in zones 9-11 can use these tropical plants in their own garden, those in frost-prone climes can choose colorful foliage for their zones. The plants highlighted in Margaret Roach's slideshow are a good start. I could try to cram a lesson on color theory into this blog post, but rarely have I ever tried to consult the color wheel in my head before choosing my plants, and sometimes the most unlikely color combinations can be surprisingly beautiful. Borrow a color scheme from a favorite outfit, magazine clipping or anything else that speaks to you, or just trust your gut. To stand beneath one of these enormous urns of Aechmea blanchetiana bromeliads was pretty exhilarating for a bromeliad lover such as myself, but I think it would be hard for anyone to be unmoved by their dramatic presence over the clipped parterres. I mean, they looked so much like fiery torches that I'm pretty sure that they illuminated the garden when the sun passed through their leathery orange leaves. I'm not sure if the urns are original, but they were likely replaced after one of Miami's catastrophic hurricanes. 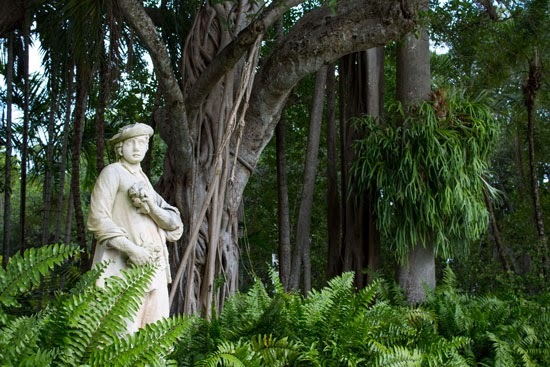 The gardens at Vizcaya are chock-full of big statements such as these, but only because there's enough room to surround each statue, specimen or architectural feature with enough space to keep things from looking crowded and cluttered. 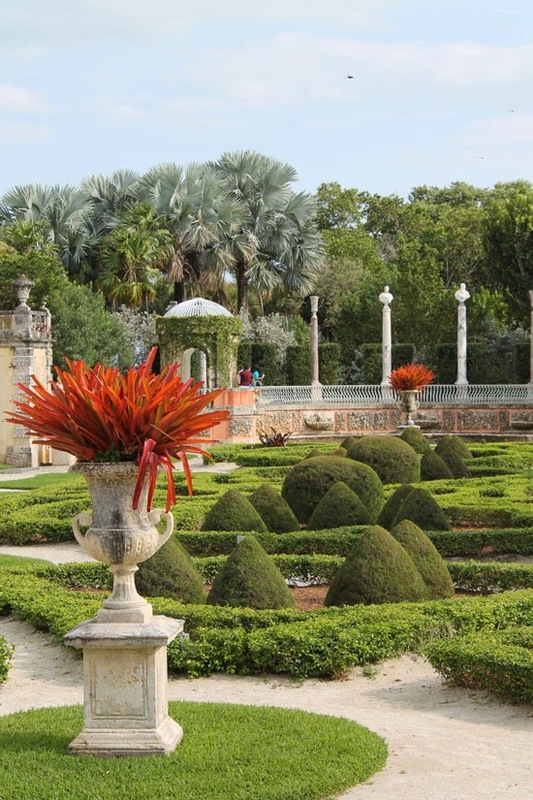 Even better, the garden pictured above has gray-leaved plants like silver buttonwood and bismarck palm in the background which serve to make them visually recede into the distance so that the green parterre can stand out. Even if you were to replace all of the structures and meticulously clipped shrubs with more naturalistic plantings, you could still get the same effect by surrounding your chosen focal point (be it a favorite potted plant, a water feature or piece of garden art) with a single contrasting color. In most cases, green will do just fine. I used to despise the tight formality of neatly clipped shrubs because they were time consuming and appeared to be forced and unnatural. While this certainly may be the case in many gardens, clipped shrubs can bring structure to gardens - much like walls can, or edgings made of brick or stone. Do they belong in your garden or mine? As is the case with just about everything, there are no black and white answers when it comes to neatly clipped shrubs. Clipped hedges of green make a garden feel restive. 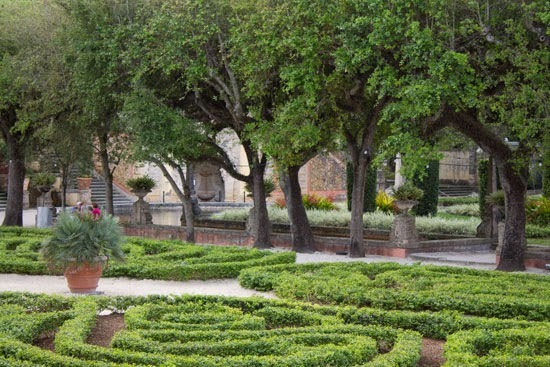 While the intricate and meticulously maintained parterre pictured above would look out of place in the small front yard of a contemporary home, and not to mention be impossible to maintain, it would be very much at home outside of a home built in a Victorian or neoclassical style. Meanwhile, an edging of clipped boxwood (or a suitable alternative for your area) and a formal hedge would lend coherence to just about any garden by giving the eye a place to rest. If you do decide to incorporate these into your own garden, do it with purpose and not merely as an afterthought. A stolen glimpse of the dilapidated Marine Garden through a wrought iron gate. 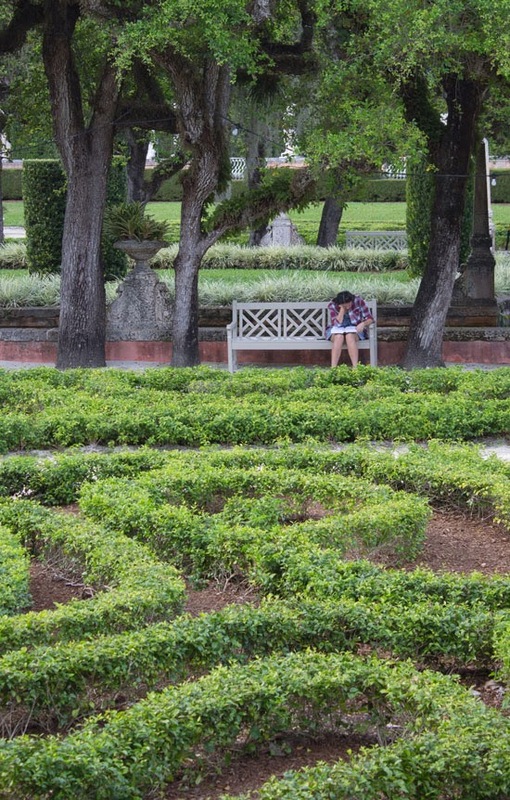 Don't be discouraged by the seemingly unattainable gardens you see in magazines, and don't you dare dismiss them as irrelevant to your own garden. You might have less in the way of budget or space than the landscape architects who designed those masterpieces, but the most valuable assets a gardener can possess are patience, a grasp of design and a whole lot of creativity. Money isn't necessary! Brilliant post! Really Steve, your artist's eye and creativity shows here, you are so spot-on with these gardening tips (I wish I thought of them myself!). So true, no matter what size garden you have. I've helped organize a large piece of property with use of formal hedges, it really works. And color? Absolutely. Margaret has that nailed, great tips! Thanks! Great post filled with inspiring ideas.